Depression Cherry was produced and recorded by the band and Chris Coady at Studio in the Country in Bogalusa, Louisiana. "In general, this record shows a return to simplicity, with songs structured around a melody and a few instruments, with live drums playing a far lesser role. With the growing success of Teen Dream and Bloom, the larger stages and bigger rooms naturally drove us towards a louder, more aggressive place; a place farther from our natural tendencies. Here, we continue to let ourselves evolve while fully ignoring the commercial context in which we exist. 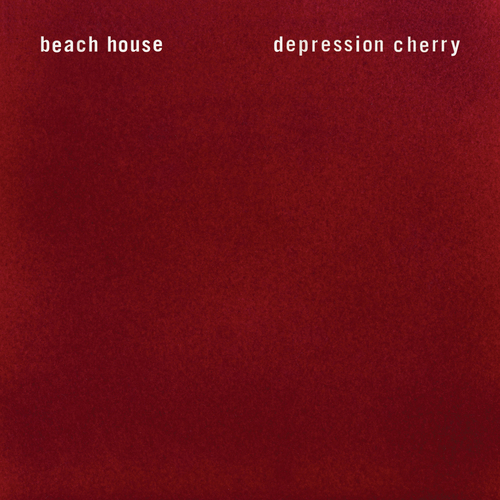 For us, Depression Cherry is a colour, a place, a feeling, an energy… that describes the place you arrive as you move through the endlessly varied trips of existence…"
If you view a band as a long-term artistic project, then Beach House have always been perfect. Victoria Legrand and Alex Scally have done everything right: They’ve found the ideal balance of dim, lush tones; their sound progresses at a graceful, even clip; they leave just the right amount of time between albums. Even their name is perfect: Beach houses are rickety, inviting spaces that, by nature of their existence, live outside of time. If a beach house were to change noticeably—if that paperback you left there last May isn’t still sitting upside-down and open to the same page, gathering dust on the same shelf you left it—you'd be upset. Part of the joy of yielding to their luxuriant music, then, comes from sensing the comfort of these solid borders framing it. Their music explores the sadness of pleasure, and the pleasure of sadness, and with each record they deepen this inquiry a little more. Their newest, Depression Cherry, might have the silliest, or at least the most inexplicable, title in their catalog (compare it with the euphonious clarity of Teen Dream, or Bloom, or Devotion), but in every other sense it’s another impeccably measured step forward. Their albums might be an ideal soundtrack for daydreaming, but Scally and Legrand seem remarkably clear-headed about their work. The most noticeable changes they make here are adjustments to lighting and angles. They’ve stripped back the booming drums of Bloom and boosted the synth and guitars, giving a new physicality to ethereal sounds. On "Sparks", Scally’s vintage-organ keyboard patch is dissonant, mixed right up front, and a little uncomfortable, like a crick in the song’s neck. The slide guitars have a brittle edge, suggesting the involvement of actual human fingers. The backing vocals are mixed a few inches closer, so they sound less like a celestial choir than an earthbound crew of worried voices whispering secrets. These minor tweaks result in a sound that retains the band’s grand theatricality, but also lets you smell the grease paint a little more, feel the itch of the Victorian-era fabrics on your skin. When Legrand sings "Tender is the night for a broken heart/ Who will dry your eyes when it falls apart?" on the sweeping mid-album highlight "Space Song", it registers as exactly the sort of high-flown Romantic soliloquy she’s always preferred. But then a buzzing, dinky-sounding synthesizer burbles up into the track, wandering onstage like a comic foil. Like the old drum machines they prefer, touches like these give the music an air of innocence, evoking silent films, community theater productions, puppet shows. Legrand and Scally have grown so adept at spinning dreams that they can turn all the lights on the set and still dazzle us. "Trance is a big part of our thing," Scally said in their recent Pitchfork interview. "We'll repeat a part for three hours while we wait for the next piece to fall into place." On Depression Cherry, you can almost hear these dawning moments as they happen, with a palpable click. The bone structures of these songs are closer to dance tracks—with builds, drops, peaks, and switch-ups—than the flourishes of traditional pop songwriting, and this frame allows Beach House to stretch out and telescope their songs without getting lost. On "PPP", Legrand alternates between a pinwheeling melody and a more open-ended, spoken-word performance, with Scally’s arpeggiated guitar stitching a visible, silvery thread through both. Underpinning everything, as always, is the drone. Legrand’s finger almost never lets up on a chord’s root or fifth note in a Beach House song. You can see her live, doing this—she keeps one hand pressed on the keyboard at all times, grounding the song even as her vocal soars and Scally’s guitar glitters. On Depression Cherry’s opening track "Levitation", a lovely saturated D chord opens slowly out of a faint high-F# drone, which never disappears from the song’s edges. The omnipresence of these drones in their songs suggests that their fantasies have a fatalistic tint: The drone is always there, the hum of the air conditioner that’s too loud in your vacation condo, the fly that won’t stop buzzing. That buzzing note is as legible on Bloom’s "Irene" as it is on many of the songs here, and it’s why we feel our gut tugged to Earth and our skulls lifted skyward when Legrand’s voice reaches for her highest notes. One of the first lines Legrand sings on the album, from "Levitation", is "There’s a place I want to take you." Isolated, it’s an emblematic Beach House lyric—a promise of transportation that leaves the destination unspecified. In fact, it doesn’t even promise arrival: she just wants to take you there. It is this melancholia, the exquisite ache of being nearly aloft, that Beach House has perfected. With every album, someone observes—rightly—that the band has never sounded exactly this full and soaring before. From their muted first two records, into their Sub Pop debut Teen Dream and then Bloom, Beach House always seem to be just leaving the ground as we catch them. It’s a trick of the light, and it speaks to the sadness that makes their music linger: Transporting experiences, they gently remind us, are always round-trip tickets back to everyday life.